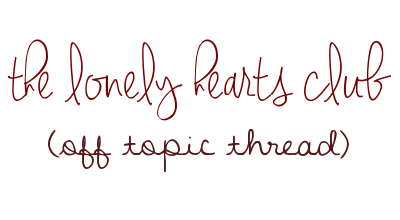 The Lonely Hearts Club (OT Thread) #47 - How does it feel to not be busy and tired all the time?? Hellooooo thanks for the new thread and fingers crossed you get some rest!!! You've been busy enjoying life, that counts as an excuse You still have to watch that German movie I recced you! What else is new with you though? I'm working part-time in a recruitment center, trying to find people "the dream job"
I literally saw the thread title before I opened the thread and thought "oh wow, that's still so accurate"
But I finished Umbrella Academy ( ) and am continuing Narcos now, and also rewatching Heroes, so that's something at least? I tried continuing the film and this time frll asleep at the hour mark :pmao: at least I finished The OA!